CHICAGO (WLS) -- Jerry Taft, one of Chicago's most trusted and popular meteorologists for four decades, announced today he will retire from ABC 7 Eyewitness News. Taft's final day on air, after forecasting weather on Chicago television for 42 years, will be Friday, January 19, 2018. Taft is the station's chief meteorologist and currently is in charge of weather duties for ABC 7's top-rated 6 pm newscast as well as the 7 pm newscast on WCIU-TV. He joined ABC 7 in 1984 as the meteorologist for the station's 4 PM newscast and was given various responsibilities throughout his career including forecasting on the morning, midday, and afternoon newscasts. In 1994, he was promoted to ABC 7 Eyewitness News at 10 pm, contributing to that newscast's perennial #1 ranking. Jennifer Graves, Vice President and News Director, said, "Jerry Taft won the trust of our viewers with his knowledge and experience forecasting Chicago's weather. He won the affection of our viewers with his self-effacing sense of humor, infectious laugh and relatability. 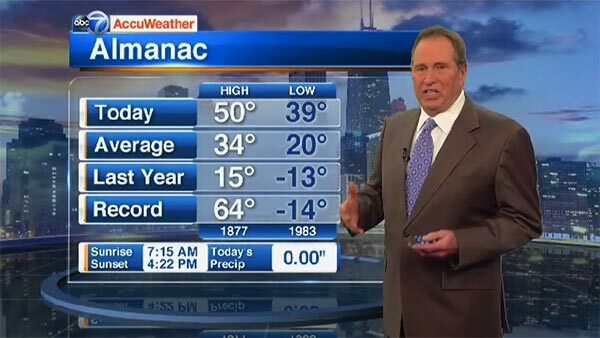 That combination has made him one of Chicago's most respected and popular meteorologists for the past four decades. All of us at ABC 7, along with his many fans, will miss Jerry. We thank him and wish him nothing but sunny skies and a continued low handicap on the golf course." Taft said in a memo to the staff in part, "It's been a joy walking into ABC7 everyday knowing that it's not work, but being with my extended family. When I first arrived here we had elevator operators. The newsroom was full of smoke and the hum of IBM Selectric typewriters. No computers. The scripts went to the set in pneumatic tubes. 35mm film was being spliced together for air and weather was presented on maps drawn by the art department. While I still have my health, wit and vitality it's time to hang out with my real family, assuming they still remember me. I want to thank everyone for their love and support and wish all a happy holiday. " He started in the Chicago television market in 1976 as a meteorologist for NBC 5 Chicago and was also the principal meteorologist on WMAQ-AM radio and later on WLS-AM. He is a member of the National Academy of Television Arts and Sciences, Chicago/Midwest Chapter prestigious Silver Circle, which honors excellence and longevity in broadcasting. He is the winner of multiple Emmy Awards. For 15 years, Taft served in the United States Air Force as a pilot and forecaster before he began his career in broadcasting. He was also a classroom teacher for aviation and flight planning and as an instructor pilot in the T-38 aircraft. Taft has had an active role in the National Multiple Sclerosis Society - Greater Illinois Chapter and has helped kick off numerous MS Walks. He was also involved with the March of Dimes during much of his career. A certified meteorologist with the AMS Seal of Approval from the American Meteorological Society, Taft also holds a Bachelor of Science degree in meteorology from the University of Wisconsin.